It was better than expected (but I'm not sure we knew what to expect). The accommodation is clean and in a great location, the staff is incredibly helpful and the breakfast was amazing! This has to be one of my favorite vacations we've taken. I don't typically write reviews as I'm normally very critical of places, but felt this place was worth giving recognition. Excellent location and top-notch service. (Special thanks to the wonderful and charming Yannis who was so friendly, welcoming and did so much to make my stay in Santorini with my teenage daughter so great!) The hotel was beautiful, quiet and private, with breathtaking views. We loved having breakfast every morning outside in front of our room with that amazing view. This is a very special place!!! Truly spectacular location, breathtaking, a view to die for. Beautiful property right on the caldera. The room was spacious, food was amazing, and staff extremely friendly and helpful. Rooms were beautiful and clean. Absolutely loved this hotel. Can't wait to go back! The view is amazing. The stuff is very friendly and the room is very comfortable. Homeric is truly an incredible property. The location is perfect, without being too close to all the action. I traveled with my girlfriend, and she still talks about our stay all the time. From the free breakfast on the balcony with the caldera views, to the pleasant and accommodating service. I wish I could go back tomorrow! Excellent location, top notch service, beautiful room/surroundings. This was my 6th time in Santorini but the first st Homeric Poems. If finances permitted, I would stay with them every time. Lock in a great price for Homeric Poems – rated 9.6 by recent guests! One of our top picks in Firostefani.Built on the cliff of Firostefani, Homeric Poems is an awarded hotel offering luxurious accommodations. 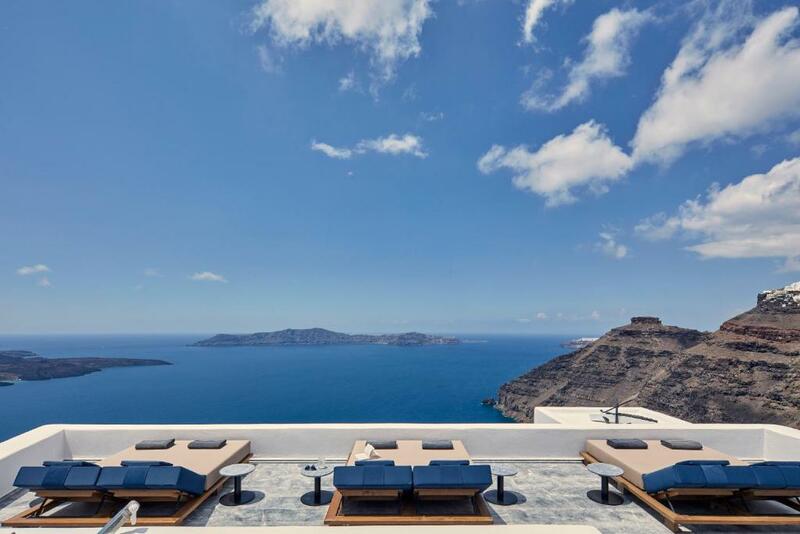 Its boutique rooms, as well as the hotel swimming pool, enjoy spectacular views of the caldera. 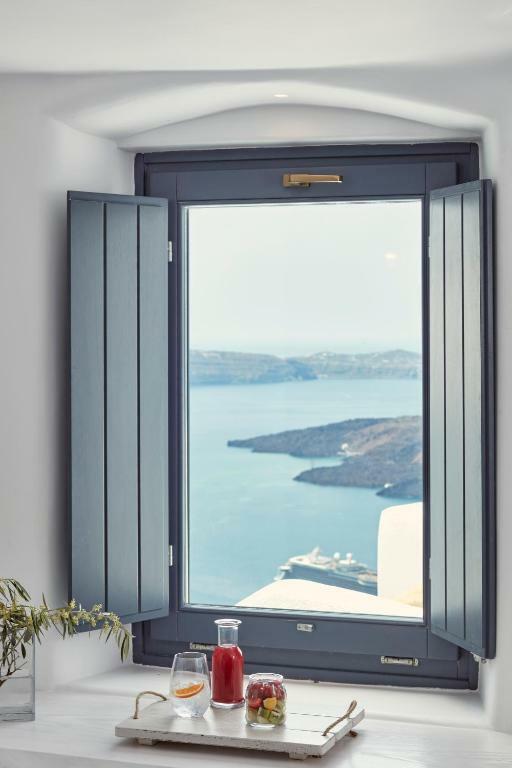 The apartments and suites of hotel Homeric Poems are simply yet stylishly decorated with respect to the traditional Cycladic style. The rooms include a comfortable seating area. 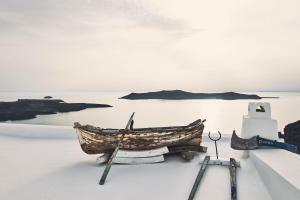 Traditional Greek specialties, made with local products and prepared by the awarded chef Skarmoutsos, are served on the rooms’ private terraces. 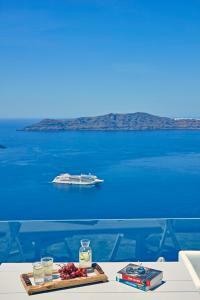 Guests of Homeric Poems hotel can enjoy their drink at the bar by the swimming pool overlooking the volcano. 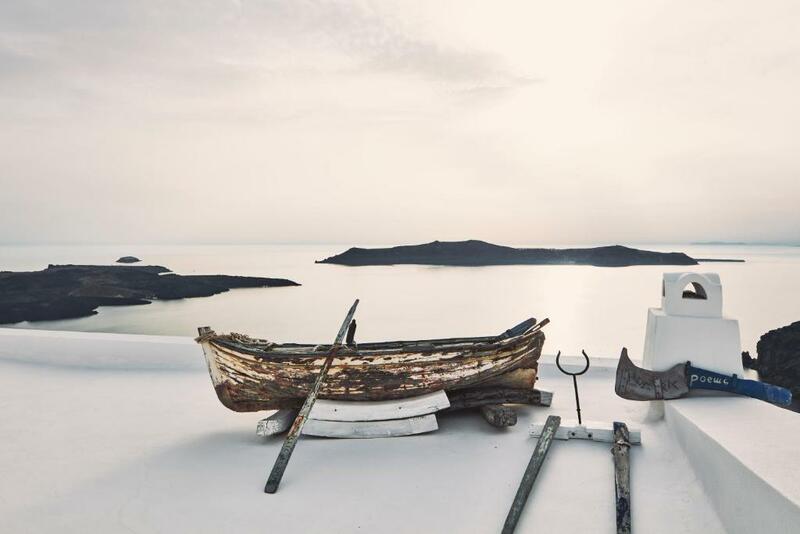 Homeric Poems is less than 0.6 mi away from Santorini’s capital, Fira. Free WiFi is available in all hotel areas and there is a public parking at a nearby location. This 2-level suite includes a living room and a dining area. It opens out to a shared terrace with table, sun beds and umbrellas with direct view to the caldera. 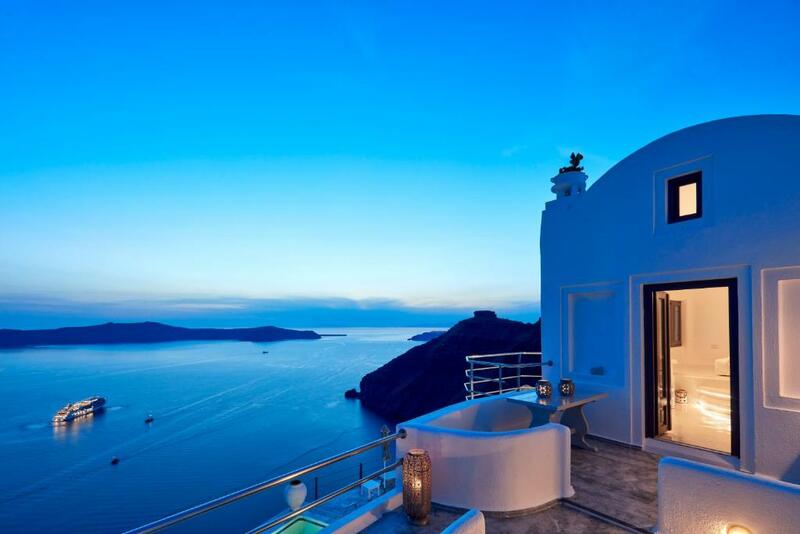 This honeymoon suite offers a spa bath, or a walk-in shower and direct view to the Caldera. Featuring a private pool, this Grand Suite is classically decorated and includes a kitchenette, indoor hot tub, bathroom with shower and furnished caldera-view balcony. 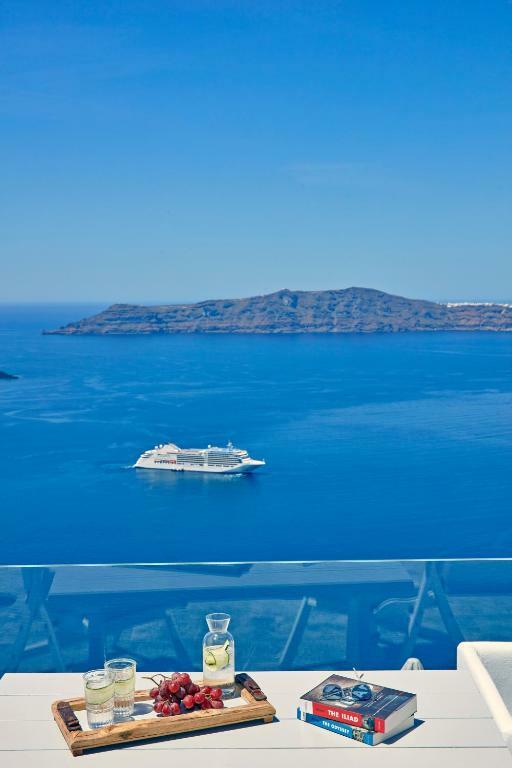 This suite has a balcony with Caldera view, bathrobe and air conditioning. This suite features a balcony with Caldera view, air conditioning and bathrobe. The fishing boat that welcomes you to Homeric Poems Hotel met all sorts of weather before taking its place at the top of the hotel. The image is familiar to the visitors and lovers of Santorini, since it is one of the most photographed sights on the island. How could it be otherwise? This beautiful boat, owned by the great-grandfather of the owner of Homeric Poems Hotel, is the first fishing boat registered and recorded in the island’s modern history. Santorini's most famous Blue Dome church is 2 minutes away on foot. The church with its white-washed walls and perfect blue dome is visited and photgraphed by thousands of people daily. Please note that guests can enjoy breakfast on their balcony from early morning until noon. The room, the breakfast, the balcony & pool, the view, the breakfast & dinner in our own balcony, nice & helpful staffs, free transfer to airport... Every detail thing is just perfect!! The location is also awesome, very quite district but only 10 mins walk to Fira. 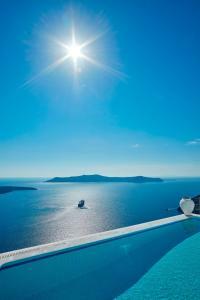 I experienced 3 hotels in Santorini and Homeric Poems is definitely the best!!! Services and staffs are superb!! They were nice to everyone and breakfasts were serviced in our balcony with excellent sea views. The location is good as well. Convenient and literally just at the back of the famous cathedral. I wouldn’t mind coming back here again! The dinner was very delicious with awesome view，you will find the price is cheaper than some restaurants beside street. Also，all staffs were very kind for whatever you want. It was private compared to the rest of the hotels . It was quiet and everybody was curtesy . Will alway recommendation to anyone . Coffee machine didn’t work and there was not way to make a cup of tea. No milk was provided either. The fridge wasn’t big enough to put a bottle of water in to keep cool. Breakfast was served 45 minutes later than we originally requested. 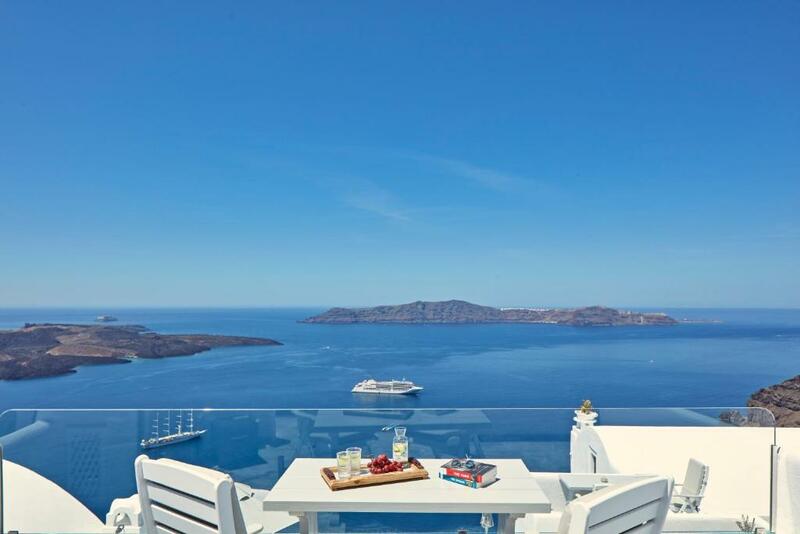 From the minute my wife and I arrived in Santorini and were greeted at the airport for private transfer to Homeric Poems, we already felt that we were in for a magical stay. After arriving a few short minutes later to St. Gerasimos Square in Firostefani, we were greeted and escorted to our first view of the Caldera. WOW!!! A short walk later we entered the magical and mystical retreat of Homeric Poems. The moment we entered the gate, we knew we had chosen the absolute best place. After a simple check in we were given a tour of the property and shown to our suite named Penelope. Incredible!!! 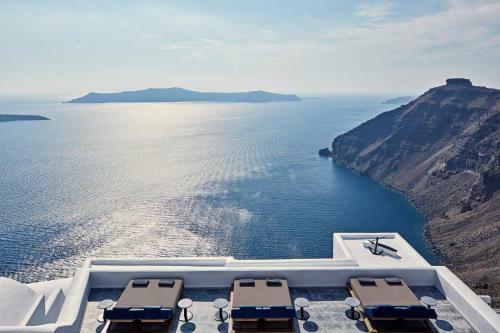 Well stated room on the cliff side with Caldera view that is Santorini. A private balcony overlooking the blue waters where breakfast is delivered to each morning, a beautiful pool and bar steps away. We were in “Homeric Heaven”. If you are looking for the only place to stay that is in the absolute best location, book Homeric Poems. You will not be disappointed! It is conveniently located between downtown Fira and Imegrovili. A simple walk to either. It is built in to the cliffs down from the walkway giving you the feeling of seclusion and quitness. I can go on about this property but what truly makes this hotel special is the staff. Elias, Yannis, Andromachi, Nakitas (one of the best mixologists we have ever witnessed), Demetria, Cornelius, and Magy go out of there way, but truly enjoy, making you feel special. We visited Greece for ten days, stayed in Athens, Crete, Firostefani, and Oia. Four hotels total. The experience we had at this hotel was the most memorable!!! We were there to celebrate my wife’s 50th birthday but felt like we were the ones being celebrated... Thank you Homeric Poems for making our trip magical. We can only hope to return again!!! Everything - friendly staff, amazing views from our room and infinity pool, location of the hotel, excellent food and cocktails. Good location, nice staff and perfect hotel! 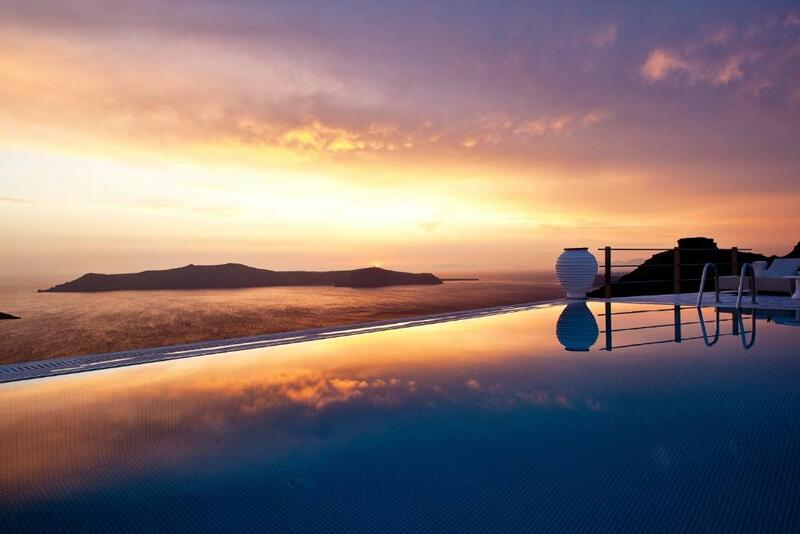 Unforgettable sunset view! Staff were absolutely exceptional. All the advice they gave was spot on. They booked us the best tables as some local Greek tavernas with views of the sunset. They helped arranged a secret dinner dorky to propose to my now fiancé. Unforgettable, entirely due to the staff. Nothing, Homeric Poems is perfection. Amazing property, amazing staff, amazing location. This was one of the best hotels we have ever stayed in and we are a couple that is well traveled. The location is breathtaking and the property is faultless. This is topped off with an amazing staff. Special thanks to Andriomahi, Elias and Yannis. It felt like we were in the lap of luxury from the moment we walked into Homeric Poems. It was so good we didn't want to leave the hotel. The beautifully appointed rooms have spectacular views and a big thanks to the guy that walks those stairs a dozen times every morning to deliver breakfast to your balcony. Always with a smile on his face (his calves must be burning). The rooms were spotlessly clean and well appointed with great Air Con and the beds and pillows very comfortable. The infinity edge pool and bar area are on the lower part of the hotel with views across the caldera. The barman has mastered his craft and makes one heck of a Mojito. The accomodation was amazing but topped off by amazing staff who were always there for whatever you needed but in a very inconspicuous way so that peace and privacy were always maintained. Close to some excellent restaurants and picturesque coffee spots. An easy walk into Fira. (15 mins) Not sure why people would want to go to Oia as the sunset from this area was spectacular. Staying at Homeric Poems was an experience that will stay in our memories for a lifetime.